In the first experimental model of deep nodular endometriosis, lesions similar to endometriotic nodules were induced, and they invaded surrounding organs in more than 40% of cases. Olivier Donnez, M.D., Anne Van Langendonckt, Ph.D., Sylvie Defrère, Ph.D., Sébastien Colette, Ph.D., Olivier Van Kerk, Jean-Paul Dehoux, D.V.M., Ph.D., Jean Squifflet, M.D., Ph.D., Jacques Donnez, M.D., Ph.D.
To establish an experimental model for the study of deep nodular endometriosis. Induction of nodular endometriosis in baboons by grafting different uterine specimens to the peritoneal cavity. Institute of Primate Research, Nairobi, Kenya, and Catholic University of Louvain, Brussels, Belgium. Ten baboons were used to develop a model of induced deep nodular endometriosis. 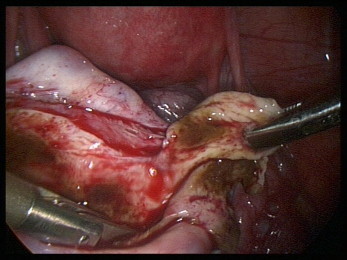 Biopsies of endometrium, endometrium plus the JZ, full uterine thickness and myometrium were grafted to the peritoneum. Macroscopic descriptions were recorded for observed induced lesions. Staining with hematoxylin-eosin was performed for histological evaluation and specific antibodies (CK22, CD10) for immunohistochemical studies. Surface area and volume of lesions, glandular density and surrounding organs invasion were also analyzed. Here we describe the first experimental model of nodular endometriosis. This new model now allows investigation of deeper nodular lesions, as well as invasion phenomena associated with nodular lesions.